Features: Active PFC design with max 85% efficiency and 99% power factor. 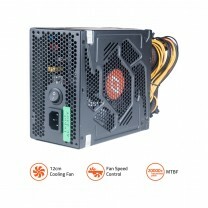 SMT (surface Mounted Technology) PSU with higher integraton. 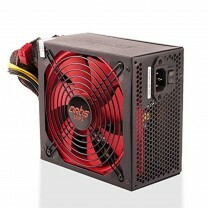 ATX 12V V2.3 provides constant reliable power for INTEL & AMD chipsets. 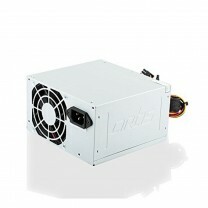 14cm cooling fan with speed control enables ultra silent operation. PCI-E ready for compatibility with NVIDIA & ATI/AMD RAEDON. 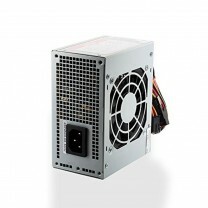 Longer DC cables Support PSU-BOTTOM-SET cabinets Erp ready with less than one 1w power consumption. 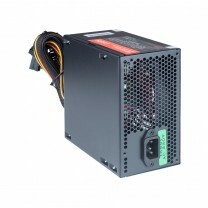 High reliability:MTBF>200,00 hours Built in industrial grade protections:over current, over voltage,under voltage,shortcircuit protectio Safety/EMI regulation:CE,FCC,CCC, I/O: 20+4 Pin x 1, SATA HDD x 8, EPS 12V(4+4 Pin) x 1, IDE x 4, PCI-E P8(6+2) x 8,Max Output: 1000W. AC Input:200-240V. Frequency: 50/60Hz. Max current: 10A. Power Cord: 1.5 Meters. Multiple protection Standards: OCP/OVP/OPP/SCP/OLP. Safety /EMI Regulations: CE, FCC, CB, CCC.